Gold (chemical symbol Au; atomic number 79) has long been valued as a noble metal and a symbol of purity, durability, and royalty. Its attractive yellow shine, resistance to corrosion, and relative rarity have made it extremely appealing for use in jewelry, ornaments, and coinage. Kings have chosen to wear golden crowns, and couples have expressed their undying love with gold wedding rings. Yet the attractiveness of gold has also brought out the worst of human nature, as it has been an object of thieves and conquerors. In recent years, gold has been incorporated in a wide variety of products, including computers, communications hardware, aircraft, and spacecraft, and newer applications continue to be tested. Gold (Sanskrit jval, Greek χρυσος [khrusos], Latin aurum for "shining dawn," Anglo-Saxon gold, Chinese 金 [jīn], Japanese 金 [kin]) is a chemical element and a precious metal that has been known and highly valued since prehistoric times. Early peoples used it mainly for ornamentation and rituals. Gold is described in Egyptian hieroglyphs dating back to 2600 B.C.E., and it is mentioned several times in the Hebrew scriptures. Ancient Egypt and Nubia had the resources to make them major gold-producing areas. The tombs of the Egyptian pharaohs were filled with items made of, or plated with, gold. In addition, the southeast corner of the Black Sea was famed for its gold. Exploitation is said to date from the time of Midas, and this gold was important in the establishment of what was probably the world's earliest coinage in Lydia between 643 and 630 B.C.E. In the history of Western alchemy, its practitioners were fascinated with the idea of producing gold from cheaply available substances. Alchemists, who regarded gold as the king of metals, searched in vain for the philosopher's stone that was expected to convert lead or mercury into gold. Despite their failure in this pursuit, they discovered various chemical processes and produced new materials, and their work laid a foundation for today's chemistry. Their symbol for gold was the circle with a point at its center (☉), which was also the astrological symbol, the Egyptian hieroglyph, and the ancient Chinese character for the Sun (now 日). Given its historically high value, gold has been the object of thieves and conquerors for thousands of years. For instance, the tombs of the Egyptian pharaohs were plundered for their gold and other valuables. In more recent years, there have been spectacular gold heists at banks and airports. The European conquest of South and Central America was fueled in no small part by reports of the gold ornaments displayed in great profusion by Native American peoples, especially in Mexico, Peru, and Colombia. During the nineteenth century, gold rushes occurred whenever large gold deposits were discovered. They included the California, Colorado, Otago, Australia, Witwatersrand, Black Hills, and Klondike gold rushes. Raw gold from California (top) and Australia (bottom), showing octahedral formations. Scientists theorize that the gold on our planet was first formed in an ancient star shortly before it exploded as a supernova. The debris from that explosion is thought to have gone into the formation of our solar system. Given its relative chemical inertness, gold usually occurs as the native metal or as an alloy with silver and other precious metals. Occasionally, it has been found in the form of large accumulations, or nuggets. More often, it is found as tiny grains that occur as inclusions within minerals or lie between mineral-grain boundaries. In addition, extremely minute quantities of gold are distributed across the Earth's crust and in seawater. There are several types of primary deposits of gold; common ones are termed reef or vein. Hydrothermal ore deposits of gold occur in metamorphic rocks and igneous rocks. In addition, sedimentary black shale and limestone deposits contain finely disseminated gold and other metals. Gold is commonly associated with quartz and sulfide minerals. The most common sulfide associations are pyrite, chalcopyrite, galena, sphalerite, arsenopyrite, stibnite, and pyrrhotite. Iron pyrite (FeS2), with its metallic luster and yellowish color, has been called fool's gold; but it may contain small amounts of actual gold. In chemistry, gold is given the symbol Au, from the Latin word aurum. Its atomic number (the number of protons in the nucleus of each atom) is 79. In the periodic table, it is placed in the same family (group 11 or 1B) as copper and silver. Also, it lies in period 6, between platinum and mercury. It occurs as one stable isotope (Au-197) and 18 radioisotopes. Although most other metals are silvery gray in color, gold is distinguished by its deep yellow hue. When finely divided, it may appear black or ruby-colored. Colloidal solutions (suspensions of tiny gold particles) are intensely colored and often purple. Gold is a good conductor of heat and electricity. It is a soft metal and the most malleable and ductile of all. A single ounce (troy ounce) of gold can be beaten into a sheet of area 300 square feet or drawn into a wire that extends more than 40 miles. Alloys of gold are often prepared to increase its strength or create a range of exotic colors. Adding copper yields a redder metal; iron, blue; silver, green; aluminum, purple; and platinum, white. When natural bismuth is added to alloys with silver, the resultant mixture is black. Native gold usually contains 8–10 percent silver, but often much more. An alloy containing 20 percent or more of silver is called electrum. As the amount of silver increases, the color becomes whiter and the specific gravity lower. Heat, moisture, oxygen, and most chemical reagents have very little chemical effect on gold. This resistance to attack by other agents is the reason why gold came to be classified as a noble metal. Gold does, however, react with halogens—such as chlorine, bromine, and iodine—to form compounds such as gold (III) chloride (auric chloride, AuCl3), gold (III) bromide (auric bromide, AuBr3), and gold (I) iodide (aurous iodide, AuI). In such compounds, gold is said to have an oxidation state or oxidation number of +3 or +1, depending on the number of halogen atoms that have combined with each atom of gold. Moreover, gold can be dissolved by aqua regia (a mixture of nitric acid and hydrochloric acid in the ratio 1:3) to form chlorauric acid (HAuCl4). Aqua regia, the Latin term for “royal water,” was so named because it could dissolve the king of metals. Gold ions in solution are readily precipitated out as gold metal by the addition of virtually any other metal to the solution. The added metal dissolves, while the gold is displaced from the solution. The gold ions are said to be reduced, while the added metal is said to be oxidized. This is a way to recover gold from solution. Under extreme conditions, gold can combine with fluorine to produce gold(V) fluoride (AuF5). In this case, gold has the oxidation number +5. Unusually for a metal, gold can also form compounds in which its oxidation number is -1. Such compounds contain the Au- anion and are called aurides. Examples are cesium auride (CsAu), rubidium auride (RbAu), and tetramethylammonium auride, (CH3)4N+ Au-. gold hydrazide(AuN2H3): an olive-green powder, it is one of several explosive compounds known archaically as aurum fulminans. Historically, gold has been associated with royalty, sanctity, and durability. The New Testament records that gold was one of the gifts offered by the three magi who visited the newborn Jesus. 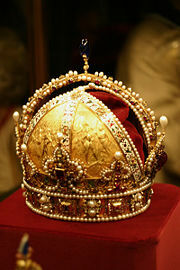 Later, Christian kings wore golden crowns to symbolize their divinely inspired authority. Also, the rituals of various faiths have involved the use of items made of gold. Wedding rings are traditionally made of gold, as a metaphor for the commitment of undying love between partners in marriage. Also, gold is associated with notable anniversaries, particularly in a 50-year cycle, such as the golden wedding anniversary or golden jubilee. Gold medals and decorations are often used to honor those who have made great contributions to society or have won great competitions. Examples are medals awarded to winners of the Nobel Prize and champions in the Olympic Games. Also, many award statuettes are plated in gold, such as those given at the Academy Awards, the Emmy Awards, and the British Academy Film Awards. A person who is particularly kind-hearted and generous is said to have a "heart of gold." The eminent orator John Chrysostom was said to have a "mouth of gold with a silver tongue." On the other hand, hearkening back to the time of Moses, worshipping the Golden Calf has become a symbol of idolatry and revolt against God. Native Americans of the Sioux tribe called gold "the yellow metal that makes the white man crazy." In Communist propaganda, the gold pocket watch and its fastening gold chain were classified as accessories of the class enemy, namely, the bourgeoisie and industrial tycoons. Pure gold is too soft for ordinary use and is hardened by alloying with silver, copper, and other metals. Gold and its many alloys are most often used in jewelry and coinage, and as a standard for monetary exchange in many countries. Given its high electrical conductivity, resistance to corrosion, and other properties, gold emerged in the late twentieth century as an essential industrial metal. Gold and its compounds now have a wide range of applications, a number of which are listed below. Gold is used in restorative dentistry, especially in tooth restorations such as crowns and bridges. Being resistant to oxidation, thin layers of gold are electroplated on the exposed surfaces of electrical connectors to ensure good connections. Gold performs critical functions in computers, communications equipment, jet aircraft engines, and a host of other products. Being a good reflector of both infrared and visible light, gold is used for protective coatings on many artificial satellites. Gold is used as a coating that enables biological material to be viewed under a scanning electron microscope. The gold isotope Au-198 (half-life 2.7 days) is used as a treatment for cancer and other diseases. Colloidal gold (containing nanoparticles of gold in suspension) is being studied in many labs for medical, biological, and other applications. It is also the form used as gold paint on ceramics prior to firing. Gold (III) chloride is used as a catalyst in organic chemistry. It is also the usual starting point for making other gold compounds. A gold compound known as disodium aurothiomalate is a treatment for rheumatoid arthritis, administered intramuscularly. It can, however, also cause photosensitive rashes, gastrointestinal disturbance, and kidney damage. Gold flake is added to some gourmet sweets and drinks. Called varak (or varaq) in India, it has no reactivity and adds no taste but is taken as a delicacy. Some use it to create super-expensive cocktails. Green gold and rose gold are alloys of gold with silver and copper, respectively, and are used in specialized jewelry. It should be noted that the human body does not absorb gold very well. As a result, compounds of gold are normally not very toxic. In dentistry, gold is regarded as the safest and most successful form of restorative material. On the other hand, liver and kidney damage has been reported for up to 50 percent of arthritis patients treated with gold-containing drugs. According to some estimates, all the gold in the world that has ever been refined would form a single cube 20 meters (66 ft) on each side. About 75 percent of that has been extracted since 1910. In large, easily mined deposits, economic gold extraction can be achieved from ore grades as low as 0.5 g/1000 kg (0.5 ppm), on average. Typical ore grades in open-pit mines are 1–5 g/1000 kg (1-5 ppm); ore grades in underground or hard rock mines are usually at least 3 g/1000 kg (3 ppm), on average. Ore grades of 30 g/1000 kg (30 ppm) are usually needed before gold is visible to the naked eye. Thus, in most gold mines you will not see any gold. In the past, prospectors found grains and lumps of gold along stream beds. They used the process of panning to separate the heavier gold pieces from the sand and gravel. Later, various techniques were developed to extract gold from the rocky vein or mother lode. Some of these are described below. Gravity separation: The rock may be crushed into fine particles, mixed with water, and made to flow down a sloping trough. Gold, being heavier than other particles, gets lodged in riffles in the trough. Amalgamation: Crushed rock is treated with mercury, which readily dissolves the gold to form a liquid alloy called an amalgam. The amalgam is separated from the rock and squeezing and heating remove the mercury. The gold is left behind. Cyanide treatment: Certain cyanide compounds can be used to dissolve the gold and separate it from the rock. The gold can then be recovered by adding other chemicals to the solution. The downside of gold extraction methods is that if they are not performed with extreme care, they can have harmful effects on the environment. On the one hand, open-pit mining operations tear up the landscape, which needs to be repaired later. On the other hand, chemical extraction techniques can leave residues of toxic chemicals in the environment. Mercury and cyanides are toxic substances, but mercury tends to linger and accumulate, while cyanides break down. Gold extracted by the above methods is often alloyed with silver and other metals, and it needs to be refined. Mints in the United States use a process called electrolysis, which produces nearly pure gold. Chemists have demonstrated the futility of the alchemist's dream of producing gold from other substances via chemical reactions. Interestingly, however, modern science has shown that it is feasible to generate minuscule amounts of gold by artificial nuclear transformations in particle accelerators. The product is likely to be one or more radioactive isotopes of gold. The world's oceans hold a vast amount of gold, but at very low concentrations (perhaps 1-2 parts per billion). No commercially viable mechanism for extracting gold from seawater has yet been identified. Since the 1880s, South Africa has accounted for a large proportion of the world's gold production. In 1970 South Africa's production of gold, about 1,000 tons, was 79 percent of the global total. By 2004, however, the country's production had fallen to 342 tons as a result of the increasing difficulty of extraction and changing economic factors affecting the industry in South Africa. The city of Johannesburg was built atop the world's greatest gold finds. Gold fields in the Orange Free State and the Transvaal are deep and require the world's deepest mines. The Second Boer War of 1899–1901, between the British Empire and the white Boers, was at least partly over the rights of miners and possession of the gold wealth in South Africa. The Indian city of Kolar is also built on a great gold deposit. Other major producers are Canada, the United States, and Australia. 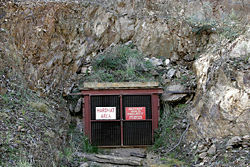 Mines in South Dakota and Nevada supply two-thirds of the gold used in the United States. The Siberian regions of Russia used to be significant in the global gold mining industry. In South America, the controversial project Pascua Lama aims at exploitation of rich fields in the high mountains of Atacama, at the border between Chile and Argentina. Like other precious metals, gold is measured by troy weight or grams. When alloyed with other metals, the term carat (karat) is used to indicate the proportion of gold present. Pure gold is given the value 24 carats, and lower ratings correspond to proportionally less gold. The purity of a gold bar may also be expressed as a decimal figure ranging from 0 to 1, known as the millesimal fineness. Gold bars with Krugerrands in the background. Historically, gold was used to back currency in an economic system called the gold standard, in which one unit of currency was equivalent to a certain weight of gold. In this system, governments and central banks attempted to control the price of gold by setting values at which they would exchange it for currency. For a long period, the U.S. government set the price of gold at $20.67 per troy ounce ($664.56/kg), but in 1934, the price of gold was set at $35.00 per troy ounce ($1125.27/kg). By 1961, it was becoming hard to maintain this price, and a pool of U.S. and European banks began acting together to defend the price against market forces. On March 17, 1968, economic circumstances led to the collapse of the gold pool, and a two-tiered pricing scheme was established whereby gold was still used to settle international accounts at the old value of $35.00 per troy ounce ($1.13/g), but the price of gold on the private market was allowed to fluctuate. This two-tiered pricing system was abandoned in 1975, when the price of gold was left to find its free-market level. Central banks still hold historical gold reserves as assets, although these levels have generally been declining. The largest gold depository in the world is that of the U.S. Federal Reserve Bank in New York. Since 1968, the price of gold on the open market has ranged widely, with a record high of $850/oz ($27,300/kg) on January 21, 1980, to a low of $252.90/oz ($8,131/kg) on June 21, 1999 (London Fixing). In late 2005, prices rose to the $500/oz mark, due to a depreciation of the U.S. dollar and inflation driven by rising energy costs. In January 1959, the U.S. M3 money supply (the broadest measure of money used by economists) was $288.8 billion, and the Official Gold Holdings of the United States was 17,335.1 tons, or 557 million ounces (there are 32,150.7 troy ounces in a ton). In other words, in 1959, there were $518 in circulation for every ounce of gold reserves held by the United States. The theoretical price should then have been $518 per ounce, but the actual price (fixed under the gold standard) was only $35 per ounce. By August 2005, the U.S. M3 money supply had risen to $9,873.9 billion, while the Official Gold Holdings had fallen to just 8,133.5 tons, or about 261 million troy ounces. This means that in 2005, there were $37,831 in circulation for every ounce of gold held by the United States. These numbers show the falling influence of gold in the monetary system of the world. As a tangible investment, gold is sometimes held as part of a portfolio because it has an extensive history of maintaining its value over the long term. In the last century, it has gained ground in relation to fiat currencies owing to inflation. Gold becomes particularly desirable in times of extremely weak confidence and during hyperinflation because it maintains its value even as fiat money becomes worthless. People who enjoy investing in gold are known as gold bugs. Many of them believe, or even hope, that one day gold's importance will return as the printing of paper money gets out of control and we end in a hyper-inflationary fiat money collapse. In some countries such as Switzerland, it is possible to hold physical gold as part of an investment portfolio. In other countries, however, portfolio managers may hold gold shares or gold bullion securities as proxies for the metal itself. Exchange-traded funds (ETFs), such as gold bullion securities, are sponsored by the World Gold Council and are fully backed by allocated gold held by a custodian. In the twenty first century, gold is at the center of a swirling controversy over its uses and value in relation to the environmental costs of producing it. The two sides of the issue are finely drawn and both present persuasive arguments supporting their view. On the one side are environmentally conscious people, mostly from the developed countries, who point both to the high environmental costs of gold mining, including huge volumes of water consumed and landscapes chewed up and contaminated with cyanide or mercury and the fact that the largest single use of gold is for gold jewelry. On the other side are representatives of the gold mining industry who point to the very significant economic benefits to the countries hosting the gold mining operations and point out that in many developing countries with high inflation rates gold is perhaps the most reliable form of wealth. They further point out that in much of India gold jewelry is the only form of wealth that many woman traditionally could own, so the jewelry is much more than a vanity possession, it is an essential element for a woman's financial security. With its many special properties and deep ties to financial markets, greed, high technology, environmental desecration, beauty, vanity, and, for some of the lesser developed countries, development, education, and economic security, gold in many ways embodies the best and the worst of humanity. In the coming decades the fate of gold may well be seen as a monitor of the progress of humanity toward a peaceful, happy world. The Columbia Electronic Encyclopedia, 6th ed Retrieved June 24, 2017. WebElements.com – Gold Retrieved June 24, 2017. BBC - h2g2 - Gold Retrieved June 24, 2017. This page was last modified on 24 June 2017, at 15:51.